Watch your suit backs, Norwegian curlers: Von Hohenlohe is laying claim to the title of Sochi's most interesting Olympian. He probably won’t come close to the medal stand, but Mexican downhill skier Hubertus von Hohenlohe will most certainly stand out at the 2014 Winter Olympics in Sochi. At 55 years of age, von Hohenlohe is the second-oldest Winter Olympian ever, and his resume reads like something out of an action movie. He was born in Mexico City and competes under the Mexican flag, but he has spent most of his life in Europe and is a prince in Germany (yes, a real prince). In addition to his five previous trips to the Olympics (he’s never finished better than 26th), von Hohenlohe is also an accomplished businessman, photographer and musician, even enjoying a modest career as a pop singer under the names Andy Himalaya and Royal Disaster. 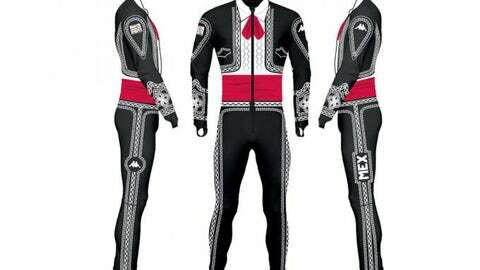 Now, von Hohenlohe is back in the news ahead of his sixth Olympiad for the racing suit he’ll wear in Sochi, which is based on the garb worn by traditional Mexican mariachi bands. "Until I went to Mexico recently to make a documentary, I never realized what a beautiful, amazing, rich past and culture they have and what a proud people they are," von Hohenlohe told NBCOlympics.com. "It actually moved me to see how much they suffered and how much they fought for what they have. The power to have your own identity is so strong and something I believe in, so I want to give it a go in a very cool, elegant way. I want to celebrate who they are, but of course in my own style." The man who previously competed in this and this has a reputation to uphold, after all. Though von Hohenlohe is unlikely to medal on the slopes, he said the title of best-dressed in Sochi "is a medal I need so urgently."